Anaemia is extremely common in patients with chronic kidney disease (CKD). Causes are multifactorial but erythropoietin deficiency, iron deficiency or diminished availability and chronic inflammation are pre-eminent. For over two decades it has been possible to correct the anaemia of patients with CKD with combinations of iron therapy and erythropoiesis-stimulating agents (ESA) with relative ease. Results of recent studies, however, have indicated that haemoglobin targets need to be revised and that more consideration should be directed to individualised treatment dependent upon the patient’s haemoglobin response, ESA dosage and level of co-morbidity. The likelihood of anaemia occurring in CKD increases as renal function declines. All patients receiving haemodialysis therapy will require treatment for anaemia, and so too will almost all of those receiving peritoneal dialysis (the difference accounted for by haemodialysis exposing the patient to a greater inflammatory state, and also regular minor blood losses). Below a glomerular filtration rate (GFR) of 45 ml/min, erythropoietin secretion by the kidney declines and when patients enter stage 4 CKD (eGFR < 30 ml/min), around 30–40% will be anaemic. Figure 1 summarises the factors contributing to anaemia in CKD. As already mentioned, erythropoietin secretion declines with decreasing GFR, and this is the predominant cause. Iron deficiency (either absolute or ‘functional’ – the latter referring to a situation where ferritin levels are within target, but transferrin saturation is decreased [< 20%], usually indicative of poor iron bio-availability) is very common, and many patients have an inflammatory state accompanied by high hepcidin levels. Other contributors are severe hyperparathyroidism (which can affect bone marrow responsiveness), blood loss on dialysis, the bone marrow effects of uraemia and the effects of certain medications (e.g. angiotensin-converting enzyme [ACE] inhibitors). ESA became available in the late 1980s as recombinant human hormone preparations. There followed a surge in use, with large numbers of patients being able to benefit. Before the advent of ESA therapy, dialysis patients regularly ran mean haemoglobin levels of 7–9 g/dL, with accompanying profound malaise, lethargy and risk of increased co-morbidity. These patients often received regular top-up blood transfusions, with attendant increases in allo-antigenicity, decreasing their chances of receiving a suitable renal transplant. Over the years, small studies have showed that benefits in anaemia correction were translated into clinical improvements, including quality of life, cognition and sexual function (see table 1). In the mid 1990s it became clear that success of ESA therapy for patients with advanced CKD necessitated repletion and maintenance of iron stores, and hence came the dawn of intravenous iron therapy for patients. The definitions of iron deficiency in CKD patients are different from those used in the general population. Absolute iron deficiency is considered present if the serum ferritin is <100 µg/L, whereas functional iron deficiency has been defined earlier in the article. Patients with advanced CKD are at risk of both; the patient with CKD has poor iron absorption and a likelihood of chronic or repeated acute inflammation. Although oral iron therapy is suitable and effective for many iron deficient patients with earlier stage CKD, the effectiveness and patient tolerance decline with decreasing eGFR, and the majority of patients requiring iron therapy at stage 4 CKD or worse are most appropriately treated with intravenous iron. Human recombinant erythropoietins have traditionally been available as one of three main products: epoetin alpha, epoetin beta or darbopoetin. The development of many biosimilar ESAs has brought swathes of new compounds to the marketplace. ESAs tend to be administered as an intravenous bolus to haemodialysis patients, but non-dialysis CKD and peritoneal dialysis patients are treated with weekly, fortnightly or monthly subcutaneous injections. Interest has more recently turned to ESA therapy for non-dialysis CKD, and in particular, the benefit to patients of elevating haemoglobin to levels above the previous European target of 12.5 g/dL. Three large RCTs have used one of the three main ESAs in non-dialysis CKD. The CHOIR (Correction of Haemoglobin and Outcomes In Renal insufficiency) study enrolled 1,432 patients with an estimated glomerular filtration rate (eGFR) 15–50 ml/min and haemoglobin < 11 g/dL. Patients were randomised to one of two groups, one with a target haemoglobin > 13 g/dL, the other a haemoglobin > 11.3 g/dL – epoietin alpha was given subcutaneously to both groups.2 The primary end point was a composite of death, myocardial infarction, stroke and hospitalisation for heart failure. The trial was stopped early by the data monitoring committee because of a significant increase in events occurring in the higher haemoglobin group. A quality of life questionnaire revealed no improvement in the higher haemoglobin group. The CREATE (Cardiovascular risk Reduction by Early Anaemia Treatment with Epoetin Beta) study randomised 605 patients with eGFR 15–35 ml/min and haemoglobin 11–12.5 g/dL to one of two groups.3 The higher target haemoglobin group (13–15 g/dL) were treated with epoetin beta. The lower target group (10.5–11.5 g/dL) only received this ESA when triggered by the haemoglobin falling below 10.5 g/dL. There was no difference in the time to first cardiovascular event, or the frequency of cardiovascular death, in the two groups. TREAT (The Trial to Reduce cardiovascular Events with Aranesp Therapy) randomised 4,038 patients with diabetes with an eGFR 20–60 ml/min between two arms, the first having darbopoetin to achieve a target haemoglobin of 13 g/dL, the other arm receiving placebo unless the haemoglobin fell below 9 g/dL, in which case darbopoetin was administered.4 The primary end point was a composite of time to death from any cause or first major cardiovascular event, and this was no different between the arms. There was major concern in that the stroke incidence was significantly greater in the higher haemoglobin arm. A separate subanalysis of 1,872 TREAT patients separated them according to whether they were poor or good responders to initial darbepoetin therapy.5 Poor responders had lower haemoglobin despite higher ESA dose (darbepoetin 232 vs. 167 µg) at 12 weeks, and a higher risk of cardiovascular events (RR 1.31) and mortality (RR 1.41). Subgroup analyses of patients in these studies who had heart failure have been discussed on page S9. Early and optimal use of iron therapy, which usually will entail intravenous administration, is recognised to be highly important. In many instances, the response to iron therapy should be assessed before a decision is made regarding the need for ESA. Besarab A, Bolton WK, Browne JK et al. The effects of normal as compared with low hematocrit values in patients with cardiac disease who are receiving hemodialysis and epoetin. N Engl J Med 1998;339(9):584–90. Singh AK, Czczech L, Tang KL et al. for the CHOIR Investigators. Correction of anemia with epoetin alfa in chronic kidney disease. N Engl J Med 2006;355:2085–98. Drueke T, Locatelli F, Clyne N et al. for the CREATE investigators. Normalization of hemoglobin level in patients with chronic kidney disease and anemia. N Engl J Med 2006;355:2071–84. Pfeffer MA, Burdmann EA, Chen C et al. for the TREAT Investigators. A trial of darbepoetin alfa in type 2 diabetes and chronic kidney disease. N Engl J Med 2009;361:2019–32. Solomon SD, Uno H, Lewis EF et al. for the Trial to Reduce Cardiovascular Events with Aranesp Therapy (TREAT) Investigators. Erythropoietic response and outcomes in kidney disease and type 2 diabetes. N Engl J Med 2010;363:1146–55. What lower levels of haemoglobin and markers of iron deficiency should we consider that “set alarm bells ringing”? A pathologically low haemoglobin in a patient with CHF might identify a higher risk individual, prompt investigation for co-morbid pathology or be considered a treatment target. Available study data primarily relate to patients with CHF and left ventricular systolic dysfunction. The majority of these studies defined anaemia according to WHO criteria (< 13 g/dL men, < 12 g/dL women) and consistently showed its presence to be an adverse prognostic marker. Subgroup analysis from the FAIR-HF study suggests that patients with a haemoglobin level above 12 g/dL and associated iron deficiency still respond to intravenous iron (accepting the limitations of trial subanalyses). As already discussed, it is not clear what the optimal number is to define anaemia in patients with CHF, but it appears it should be above 12 g/dL. Similarly, standard ferritin cut-off values are probably flawed since inflammation, an integral component of advanced heart failure, is a major stimulus for ferritin. Patients can still have a normal ferritin level even when there is iron deficiency. Iron has multiple actions in addition to promoting erythropoiesis. It is needed for numerous catalytic enzyme systems and in muscle metabolism, while mitochondria need iron to generate energy. This may explain some of the benefits with iron repletion in FAIR-HF, the hypothesis being that iron repletion has benefits in addition to increasing haemoglobin levels. Studies in animal models suggest that iron deficiency is harmful and that iron repletion helps; this needs to be confirmed in human studies, where we already know that lower haemoglobin levels are associated with adverse outcomes. A recent study of patients with CHF (n=546) has shown that iron deficiency as defined in the FAIR-HF study (serum ferritin < 100 µg/L or < 300 µg/L, if transferrin saturation [TSAT] < 20%) was present in 37%.1 It was an independent predictor of adverse outcome. Iron deficiency was common in both anaemic (57%) and non-anaemic (32%) patients (anaemia being defined according to WHO criteria). It may also be of value, where possible, to take into account previous haemoglobin level and markers of iron deficiency. For example, a progressive drop in haemoglobin over several months suggests that early investigation would be appropriate. What constitutes best practice for investigations of aetiology of anaemia in patients with CHF? A detailed patient history and clinical examination is fundamental and may direct further investigation. Basic tests, such as urea and electrolytes (U&Es), thyroid function tests (TFTs), liver function tests (LFTs) and C-reactive protein (CRP), should be performed for all patients. Whilst deficiencies of vitamin B12 and folate are relatively uncommon, they are amenable to safe correction and should be excluded. Accepting the difficulties already highlighted regarding definition and assessment of iron deficiency, the panel thought it reasonable to measure serum ferritin and TSAT, and to consider iron treatment for those patients with absolute (ferritin < 100 µg/L) or functional (ferritin > 100 µg/L but TSAT < 20%) iron deficiency. 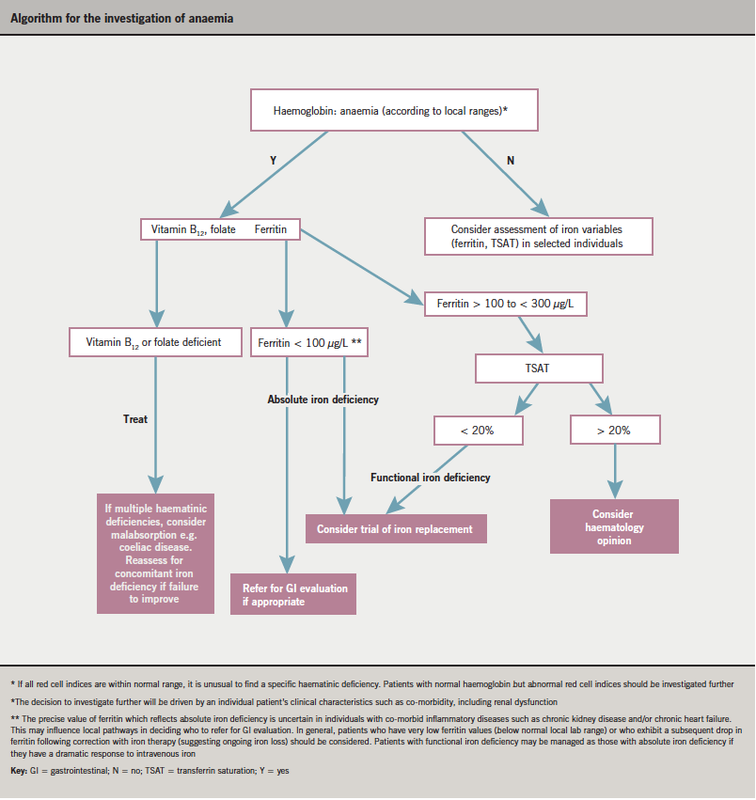 The panel developed a pragmatic algorithm (see page S15) to help guide investigation and potential treatment. The algorithm focuses on symptomatic patients with low haemoglobin according to local normal ranges. For a very small group of patients with normal haemoglobin levels, investigation may be appropriate (e.g. consistent drop in haemoglobin within normal range over time and/or microcytosis). Some patients will require more detailed investigation by either a gastroenterologist or haematologist. The decision to investigate further will be driven by an individual patient’s clinical characteristics such as co-morbidities, including renal dysfunction. The precise value of ferritin which reflects absolute iron deficiency is uncertain in individuals with inflammatory diseases such as CKD, which will influence local pathways in deciding, for example, who to refer for gastroenterological evaluation. In general, patients who have very low ferritin values (below the normal local lab range) or who have a greater than anticipated drop in ferritin following correction with iron therapy (suggesting ongoing iron loss) should have a gastroenterological opinion. Who should be considered for iron therapy ? The data from FAIR-HF, using intravenous iron, provide the best guidance we have available at present. Intravenous iron was associated with improvements in well-being, heart failure class, and an increase in six-minute walk distance in patients with heart failure and iron deficiency, with and without anaemia. Correction of iron deficiency is currently linked to improvements in symptoms and quality of life. It seems reasonable to focus on symptomatic subjects. The available data described relate to the use of intravenous iron. However, the availability of intravenous iron to those looking after patients with CHF may be limited. It is therefore important to develop local pathways to streamline the investigation and treatment of patients. Whether oral iron is effective in patients with CHF is unknown. Associated inflammation and gut oedema may contribute to iron malabsorption. Since oral iron often causes side effects there “is a world of difference between prescribing oral iron and a patient taking oral iron”. The majority of patients with symptomatic CHF will be on at least four cardiovascular drugs, which again may influence compliance with new drugs. Oral iron is rarely used in patients with more advanced chronic renal disease, and almost never in dialysis patients. Pragmatism is important. In some circumstances or localities (driven by access to intravenous iron and day case units) it may be sensible to give a trial of oral iron replacement in symptomatic patients with CHF (this is not in conflict with NICE anaemia guidelines). In FAIR-HF, iron therapy was given repeatedly every two to four weeks. Yet single dose total iron replenishmentis far more attractive from a health economic perspective and patient’s point of view. Modern formulations of intravenous iron therapy are safer and much more tolerable to the patient, and quicker and more straightforward to administer. Many clinicians believe the pendulum is swinging away from oral iron. Intravenous iron can be given safely over a relatively short period of time on a day case unit. Around 70% of patients with heart failure have this diagnosis made during a hospital admission, and anaemia is often detected in very symptomatic patients at the same time. Giving intravenous iron in this situation is relatively straightforward (in the absence of infection and when the patient is stabilised and euvolemic). What is the current role for ESAs in CHF treatment? The RED-HF study looking at darbepoetin alfa in CHF should answer the question. Recent data from studies in patients with CKD have highlighted some concerns about ESAs, especially when they are used in high dose. The consensus view was that at present there is not strong enough evidence to recommend routine ESA therapy in heart failure. Janowska EA, Rozentryt P, Witkowska A et al. Iron deficiency: an ominous sign in patients with systolic chronic heart failure. Eur Heart J 2010;31:1872–80. Low haemoglobin and iron deficiency are common in patients with chronic heart failure. Recent studies suggest that treatment with intravenous iron is associated with improvements in symptoms and quality of life. Data on mortality and hospitalisation are lacking and should be a key focus over the next few years. Bringing together expertise from a number of specialties is essential to ensure that patients receive optimal investigation and treatment in timely fashion.